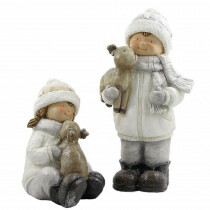 This set of sparkling tushka figurines features an adorable pair dress in white playing with baby deer. Their cute faces look great standing together; or even separated. Sparkling details to the tushka's will definitely give the Christmas vibe in your home. Indoor and outdoor use.